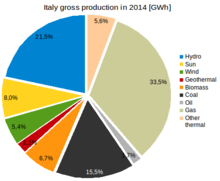 Italy consumed about 185 Mtoe of primary energy in 2010. This came mostly from fossil fuels. Among the most used resources are petroleum (mostly used for the transport sector), natural gas (used for electric energy production and heating), coal and renewables. An important share of electricity comes from import, mainly from Switzerland and France. The share of primary energy dedicated to electricity production is above 35%, and grew steadily since the 1970s. Electricity is produced mainly from natural gas, which accounts for the source of more than half of the total final electric energy produced. Another important source is hydroelectric power, which was practically the only source of electricity until 1960. Wind and solar power grew rapidly between 2010 and 2013 thanks to high incentives. Italy has few energy resources, and most of supplies are imported. In 2014 Italy consumed 291.083 TWh (4790 kWh/person) in electricity, consumption in household were 1057 kWh/person. Italy is a net importer of electricity: the country imported 46,747.5 GWh and exported 3,031.1 GWh in 2014. Gross production in 2014 was 279.8 TWh. The main power sources are natural gas and hydroelectricity. Italy has no nuclear power since it was banished in 1987 by referendum. In Tuscany was built the first geothermal power station. In 2014 the geothermal production was 5.92 TWh. All active Italian geothermal power stations are now in Tuscany. According to Energy Information Administration, the 2009 Italian CO2 emissions from energy consumption were 408 Mt, slightly below Indonesia 413 mt. worldwide, Italy was ranked 17th in 2009 according to this list. The Italian emissions decline of 9% in 2008–2009 was rather influenced by the European economic recession 2008–2009 than large sustainable changes in energy consumption. From 2008 to 2009 change was at a 6.9% decline in Europe and at a 7.5 increase in Asia & Oceania. Emissions of consumption could be a more significant indicator rather than national greenhouse production: many European companies have moved production from Europe to Asia the last ten years, which does not necessarily change the overall emissions of the world or the company. According to the Guardian, the most widely cited international dataset for consumption emissions is from year 2001 including the consumption emissions per capita of all greenhouse gases. Italy’s footprint in 2001 was 12 ton CO2 per person (rank no 21) Italy’s domestic share of greenhouse gas emissions was 62%. This page was last edited on 28 August 2018, at 15:01 (UTC).